Japan Farmers Markets: Blueberries on the way! That sweet little patch of budding bushes is turning into fat blueberries even as I type. 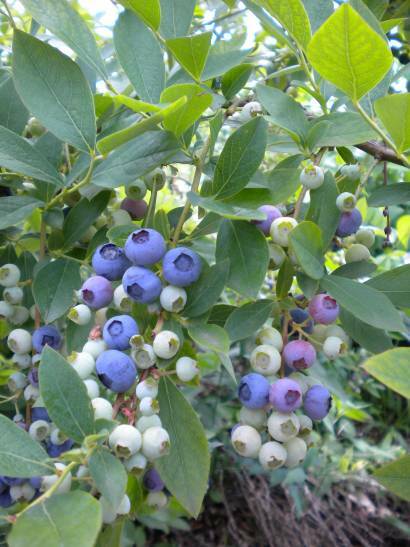 The bushes are in full leaf, of course, and as we've worked in the nearby fields planting, harvesting, pruning, and staking, the blueberries working away each day, too. We've got a few still in the freezer from last year, and I'm hoping to harvest enough for at least one batch of jam. There's a U-Pick place just up the bike path near the nashi orchard, so just maybe my berry dreams can come true! Will love to hear about the berry picking- and the jam making! The pic looked great. Thanks for sending the books! I'm quite excited, and really just so pleased. It's awfully sweet of you!